The sixth annual Informed Scotland Organisations & People Special has been published. It’s a snapshot of a busy and ever-changing learning & skills landscape, helping our subscribers to quickly locate the key organisations and make sense of where they fit into the bigger picture. 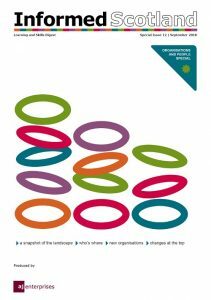 This year there are links to over 360 organisations, up from 330 in 2017 and more than twice as many as in the first edition in 2013. There have been many changes since last year’s edition, including new organisations, mergers and closures, promotions, moves and retirements. We’ve added a new section of the six regional improvement collaboratives – regional alliances of the 32 local authority education departments – and a new section covering research & development organisations in community & adult learning.